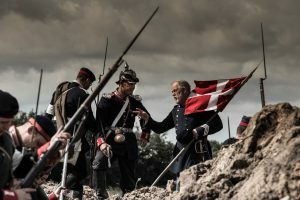 The Danish Weapons Act distinguishes between guns from before and after 1870. Original muzzle loaders from before 1870 and breech loaders without device cartridges from before 1870 are not included in the Weapons Act. Therefore, they do not require a special permission from the police. You are not allowed to bring black powder but it will be handed out in the camp by appointment. Valid documentation can be a copy of criminal record or weapons permission issued within 6 month. I hereby allow the police to gather information on possible criminal cases during the consideration of this application. Danish police demands, that all participants carrying weapons are able to document, that they have been registered with the police before the event. To make it easier for each participant, Historiecenter Dybbøl Banke and the Danish Police have made a feature on this page, where you can add the aforementioned documentation. We will take care of the remaining work. If the police needs further information, you will be contacted.